When public opinion begins to swing on a hot button issue, there’s inevitably some resistance from the displaced, former majority. We’re currently seeing this with cannabis legalization. A plant nearly universally portrayed as a dangerous narcotic is now accepted as a medical treatment, and a relatively harmless recreational drug, by most Americans. As we adjust to this new pro-legalization paradigm, we’re bound to hit a few speed bumps along the way. The NIMBY’s are just one of those hiccups. These are the groups who profess compassion toward cannabis use and agree that seriously ill people should be allowed to use it to treat their illnesses. They just want them to go somewhere else to do it. In our last visit to the NIMBY chronicles, we explored the cognitive dissonance allowing local governments to ban, or de facto ban, cannabis activities despite our current paradigm shift. In some cases, these bans take place in counties that overwhelmingly voted to support Prop 64. Now we’ll look at Calaveras County’s surprise move to ban commercial activity after accepting millions for implementation. We’ll also examine Kings County’s not-so-surprise ban ordinance, and touch on Fontana’s de facto ban on personal cultivation, sparking a lawsuit with potential to redefine several aspects of local verses state law. 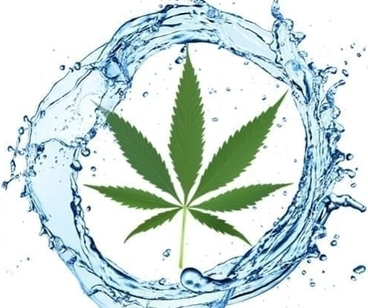 Is Cannabis Really a Water Hungry Crop? What’s Causing the Current Backlash Against Legalization? 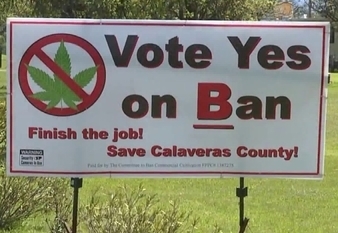 Calaveras County takes the prize for the NIMBY awards this month. After raising nearly $10 million in fees and spending a pretty penny on crafting regulations, the Board of Supervisors voted for an outright ban on all commercial cannabis activity. As farmers and activists screamed from the aisles with threats of instant litigation, the anti-cannabis lobby celebrated their victory. In addition to losing their investments, fees and taxes, growers are being required to fork over the additional expense of returning their land to its former state within 24 months. Many farmers had already spent thousands to prepare for cultivation, and must now invest in reversing those changes without the benefit of their intended cash crop. There is some small hope. 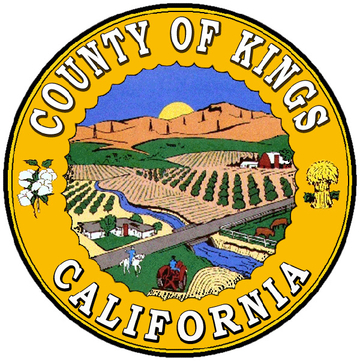 The county board is attempting to prepare two ballot initiatives–one for the ban and one to allow commercial cultivation. If they can finish the initiatives by the end of January, the county can vote on this hotly contested issue in June; however, it’s unsure which direction it’ll vote. In 2014, the Press Democrat shared a widely-contested water usage figure of six gallons per cannabis plant a day. Lawmakers have quoted this figure ever since as they jump on the drought bandwagon to enact their local cannabis bans. Counties like Yuba even used the drought as a reason to pass their ban under an urgency ordinance so it couldn’t be challenged by the voters. The article’s source for the water usage figures wasn’t cited, but the biggest problem was that the plant’s water footprint wasn’t put into comparative perspective with other crops. An eighth can last the typical smoker anywhere from a few days to a month. The figure varies so widely because there’s no such thing as a typical smoker. But it’s easy enough to predict that an eighth will last most much longer than one day. A more recent water usage report used information from Mendocino growers to calculate that it takes roughly 1.875 gallons to produce one cannabis eighth. For comparison, it takes 1.1 gallons of water to produce just a single almond. Perhaps that’s not a fair comparison since almonds are a food crop, and it’s generally agreed food is a priority. Perhaps we should compare cannabis to another widely-used recreational crop–wine. The most conservative estimates put a water footprint of 2 to 3 gallons per four ounce glass at the low end, and up to 15 gallons at the high. Remember, this is just for one glass of wine. How many glasses does the average person drink in a sitting? Two? Three? Cheech and Chong couldn’t come close to the water footprint of your average wine drinker. 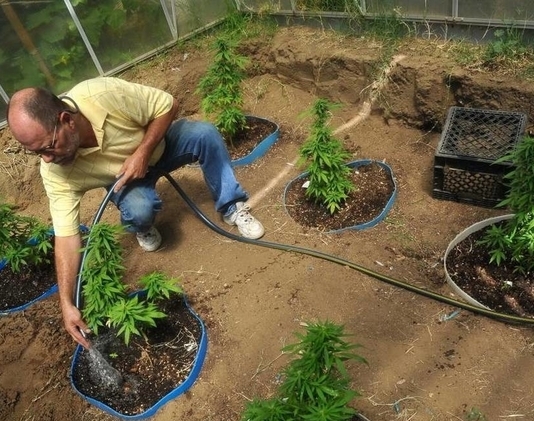 Perhaps Kings County should consider switching over to primarily pot production if they want to save on water. The ordinance states, “the experience of law enforcement in Kings County is that marijuana cultivation increases the risk of crime in our county.” This sounds more like a gut feeling than an statistical or logically provable fact. Nonetheless, such statistics are sensationalized. There was an oft-quoted 154% increase in traffic fatalities related to marijuana between 2006 and 2014. This sounds very alarming, but there are less than 100 fatalities a year. While each was, without doubt, a tragedy, only roughly 30% only had cannabis in their system; the tests have no way of judging impairment since cannabis stays in the system for days or even weeks. Finally, Kings County tops off their list of complaints with their belief that cannabis is a gateway drug that could lead to methamphetamine and heroin use. Perhaps they’re not aware of statistics showing a reduction in opiate use in states with legal MMJ. Yet it’s hard to believe they haven’t seen patent No. 6630507, allowing the federal government to grant exclusive rights to research certain cannabinoids as a neuroprotectant. Some local governments didn’t just stop at banning commercial cannabis. 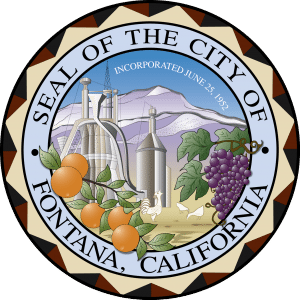 Fontana residents are also under a de facto ban for personal cultivation. The ordinance, which was passed Jan. 24, 2017, requires personal cultivators to apply for a permit costing $411. It’ll be denied if the applicants have any pending code-enforcement issues with the city or overdue fees. A completed live scan at the applicant’s own cost. No illegal possession felony convictions for the sale, manufacture, transportation, or cultivation of a controlled substance within the last five years. A signed, notarized affidavit from any landlord or property owner, other than the applicant, that acknowledges and grants permission for cultivation. A full inspection and approval of the cultivation area by city staff. A lawsuit backed by the ACLU and the Drug Policy Alliance has already been filed to challenge the ordinance, but it could take years to go through the courts. Meanwhile, citizens are faced with punitive action from their local governments for doing exactly what they voted to allow. Now it’ll be up to California’s courts to decide whether Fontana’s regulations are reasonable, or simply designed to block the implementation of voter-approved law. It’s hard to understand how so many voters can approve of cannabis as a medicine, but still deny the cultivation and distribution of that medicine anywhere near them. People don’t want to be near hog farms because mass production causes environmental damage and noxious odors. Some even make these complaints as they chow down a BLT slathered in mayonnaise. It’s basically the same story for the much-maligned marijuana plant with one glaring exception: cannabis cultivation can actually help the environment if done right. After all, it’s well-known that hemp is a carbon-neutral source of fiber, fuel and an excellent vegetable protein source. The environmental damage sometimes caused by unregulated cannabis crops is the result of guerrilla cultivation destined for the black market. Streams are diverted, public lands are abused, and houses are converted into energy-gobbling, neighborhood-ruining grow operations. This isn’t speculation. It’s been occurring in California for years–especially in areas with outright bans and no regulations. Then why would any public body vote against regulating commercial cannabis activity so we can stop these abuses? Lots of people want to get into the cannabis business and they’re willing to take many financial risks to do so. We’re now witnessing the new “green rush,” and if we want to know some of the hidden consequences, we only need look at the history of the Gold Rush. Real estate prospecting drives up property prices to the detriment of overall market stability. Properties are snatched up at the first hint of a friendly ordinance at well over market rates. New prospectors will often begin grading and developing their new property for cultivation before regulations are fully in place. Then, when an ordinance doesn’t pass or their property is zoned out, it’s often abandoned or sold at loss. In some cities, property owners are asking ten times a property’s value at the mere hint of a favorable zoning ordinance. In others, entire blocks lay empty as guerilla cultivators trade in their hidden suburban grows for legitimate outdoor cultivation. Essentially, California’s real estate market is in absolute chaos. But this can be expected with any significant economic boom. Silicon Valley suffers a massive homeless problem as tech-entrepreneurs purchase local real estate for massive markups; yet they fail to raise workers salaries to match the increased living cost. Los Angeles’ Skid Row now encompasses 50 city blocks, with more giant encampments popping up in Anaheim and elsewhere. Hopefully the cannabis industry can bring much-needed employment to California’s unemployed and under-employed. Since legalization, Colorado boasts the nation’s lowest unemployment rate, 2.3%, but it may take years for their real estate market to adjust. Colorado was also the second-fastest growing state in 2016. 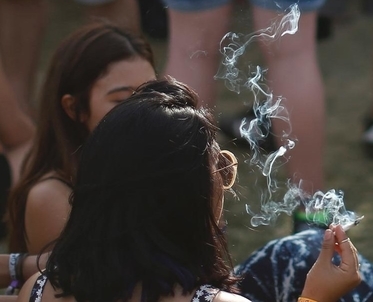 In an almost laughable NIMBY move, the Coachella Music Festival is continuing their ban on cannabis in their backyard despite legalization–even for those with medical recommendations. According to the Los Angeles Daily News, concert-goers who forget to leave their legal stash at home can drop off their burdens at the concert’s amnesty boxes, no questions asked. The article doesn’t say where those lucky amnesty boxes will be going after the concert. So Coachella wins the award for “Most Unenforceable Ban in the State,” hands down. But ya’ gotta love their spirit.